A green salad or garden salad is most often composed of leafy vegetables such as lettuce varieties, spinach, or rocket (arugula). 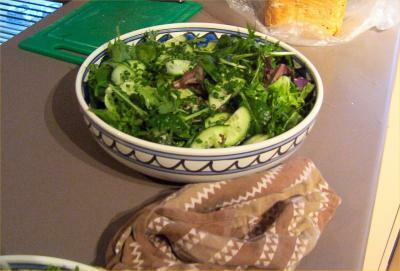 If non-greens make up a large portion of the salad it may be called a vegetable salad instead of a green salad. Common raw vegetables (in the culinary sense) used in a salad include cucumbers, peppers, tomatoes, onions, carrots, celery, radishes, mushrooms, avocado, olives, artichoke hearts, heart of palm, watercress, parsley, garden beets, and green beans. Nuts, berries, seeds, and flowers are less common components. Hard-boiled eggs, bacon, shrimp, and cheeses may be used as garnishes, but large amounts of animal based foods would be more likely in a dinner salad.